Termites can destroy your home from the inside out. They can eat through the beams that provide your home’s structure and support. They can crumble your floorboards and even the walls. They can cause the paint to blister and peel. By the time you notice some of the signs that termites are present, you might already have a big problem and your house may have already suffered extensive damage. Routine Phoenix termite pest control can help protect your home, or you can invest in termite treatment in North Phoenix to eradicate termites if you find that you already have an infestation. There are a few types of termite treatment available depending on what kind of termites you have, where they are in your home, and how extensive the infestation is. You must hire a professional exterminator to perform a thorough termite inspection to determine the right treatment option. Termite pesticides can be applied directly to the affected area in some cases. Holes can be drilled into the wood to allow for greater penetration of the pesticide. The pesticide can also be applied to the soil around the house, which would kill termites traveling to and from their nest and the house. Liquid pesticides are highly effective, but they can also pose a safety risk depending on the chemicals they contain and how they are applied. For instance, some termite pesticides can kill the vegetation around the soil, so they could contaminate a home garden or plants that may come in contact with pets or children. A small trench is often dug around the perimeter of the house for applying these pesticides, but even still, the chemicals can affect the surrounding vegetation. It is important that you talk with your exterminator about the options so that you get a pesticide that is effective yet safe. Termite baits also contain poison that kills these pests, but the baits do not spread that poison to the surrounding area. Instead, the baits are placed inside the mud tunnels that the termites build to travel between your home and their nests, or they are placed near the tunnels and the nesting area. Termites are attracted to the bait and eat it, and then they die. The chemicals inside the bait do not spread upon contact with the soil or other materials. Termite baits can be used in conjunction with liquid pesticides to completely eradicate a colony. Pesticides can sometimes just repel termites in Peoria, but the combination of treatments can ensure that termites stay away from your home and that any termites in the vicinity are killed so new infestations do not occur. Extensive infestations can be treated with fumigation. A tent is placed over the home so that the entire structure is covered. Air-borne chemicals are then released inside the tent so that termites are killed wherever they are in the home. Fumigation can take anywhere from 24 hours to 72 hours, depending on the extent of the infestation, the size of the home, and the type of termite. You would have to make arrangements to stay with family or to stay in a hotel as the home would not be safe for habitation during that time. You can usually return to your home about six hours or so after termite treatment is finished. The exterminator will test the air levels in the home to be sure that the toxic gas is no longer present. During the Phoenix termite inspection, the exterminator will talk to you about all the termite treatment options and which ones would be most effective for your home and your budget. The Phoenix termite exterminator will also recommend a regular schedule of termite pest control to keep termites away from your home and prevent future infestations. 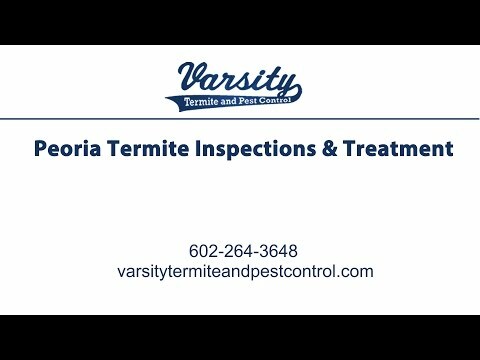 Varsity Termite and Pest Control provides effective termite treatment for homes and businesses in Arizona. Our Phoenix termite pest control services aim to eradicate termites that may have already taken up residence on the property, as well as to keep termites away from the property. We offer a termite inspection to help you understand the extent of the problem and to learn more about your termite treatment options and the costs. Give us a call in Arizona today to learn more about what you can do to get rid of your termites and keep your home safe from infestation. Read the rest of Did You Know that Termites….